I wrote yesterday about why I'm making postcards. The London one is still available. This is the postcard from Nottingham. Nottingham was the second day of the tour and our first day with the brilliant Lovely Eggs. We played quite an early show as there was a club night afterwards. Towards the end of our set, out of the corner of my eye, I could see a man with some inflatable bananas impatiently waiting for us to finish. This was confusing. As it was their first night with us The Lovely Eggs thought it might have been part of our set and that we were about to reply to a banana based song. Maybe Bananas in Pyjamas or Yes, We Have No Bananas. We weren't though unfortunately as yet there are no banana based songs in our set. The second we left the stage the man with the bananas sprung into action and hung them in the middle of the room. I don't know much about Nottingham. I'd like to think though that it is full of surrealist artists who go to all the gigs and review them in an unusual way and that someone hanging a huge pair of inflatable bananas in the middle of the room immediately after you've just played is a massive compliment. I asked all the drunk students turning up to the club afterwards if this was the case, but they just looked at me like I was mental. 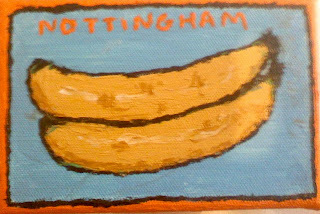 My Nottingham Postcard is made of two 4"x6" 100% Cotton Canvases, Acrylic Paint and Sharpie Pen. I am only making one postcard for each place we played. I would prefer it if you were at the gig. But I will also sell it to you if you really wanted to be there. I will fill in the back with what happened that day address it to you and add a stamp from the stamp book I've just made. 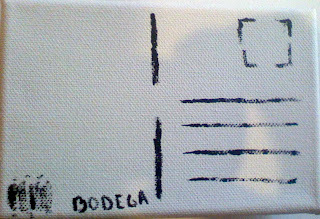 Don't worry though when I send you the two canvases I will put them into an envelope and use real stamps. My Postcards are £35 plus postage. 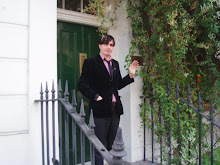 You can email me at eddie.argos.resource@gmail.com. I'm afraid that was the Electric Banana clubnight, sorry to sour your buzz. are you sure Liam? because the last time I check the place all was all right, the place continued be the same.